The most common type of rabbit mites are called cheyletiella and cannot be seen with the naked eye. They may also be referred to as 'mange' mites. They are most likely to be found in the nape of the neck area and/or on the back of the rabbit. This condition gives a ' walking dandruff' effect, which is, in fact, dandruff created by the mites movement. 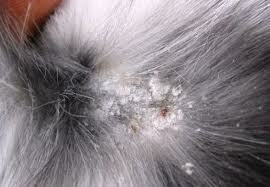 The infection leaves small round areas of missing fur, giving a bald effect and sores in the area, that appear like holes. The mites can travel on hay and have been known to carry myxomatosis. Rabbits will try and scratch the infected area. Mites can actually burrow deep into the rabbits skin. Treating the mites alone, sometimes may not stop these parasites from reoccurring in the rabbit. One problem may be, when a rabbit inherits the mites from their mother. The mites burrow and this can be a reason why they just seem to come back. Fur mites are a lot bigger than the cheyletiella mite and are two tone in colour. These mites can just about be seen with the naked eye. Again they can travel on hay and have similar symptoms to cheyleteilla. It should be quite apparent, if your rabbit has any form of fur mites, since the rabbit will scratch, be uncomfortable and there will be fur loss. Mites appear on rabbits in spring and mild weather. However if you have a house rabbit, then owing to heating in the home this may not be relevant. Ear mites, named Psoroptes cuniculi, invade the ear canal and causes intense irritation which will result in a discharge (referred to as canker). 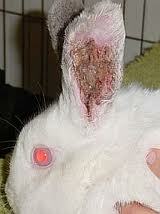 The infection can be one of the most painful skin conditions that a rabbit can suffer from. This condition can be detected by the rabbit scratching and soreness at base of the ear, leaving a grey-brown to reddish scaly crust. A rabbit with mites will pass the mites onto another rabbit simply by contact alone. The mites can also be passed to other animal as well as humans. Both the rabbit and the rabbits living area have to be treated. Great care must be taken in the choice of treatment for your rabbit. Some treatments such as frontline are meant for cats and dogs and can seriously harm, if not kill a rabbit. For treatment of rabbit mites, NEVER use frontline or any goods that contain fipronil or permethrin, which are common ingredients in flea and mite treatments and insecticides. Never use flea powders even if advertised as 'rabbit safe' and never use flea shampoos, again, even if advertised as 'rabbit safe'. Bathing is strongly discouraged as stress can cause serious health problems. Do not use flea baths or dips nor flea control sprays or similar control methods. Ah, I hear you saying 'but you have not said what I should use'. Well, that's because it's best that you go to the vet and get professional advice, in the first instance. Use a flea comb as a supplement to the main method of treatment. Combing your rabbit with a flea comb is rewarding both physically and psychologically for the rabbit, as most rabbits love being combed and having attention paid to them. There are products on the market that can be used for treating the hutch. Again great care must be taken when choosing a treatment, since obviously chemicals can be harmful to rabbits. By all means, firstly diagnose if your rabbit has rabbit mites and if so which mites your rabbit has. Then go to the vets and work with your vet for what will be the safest and best treatment.